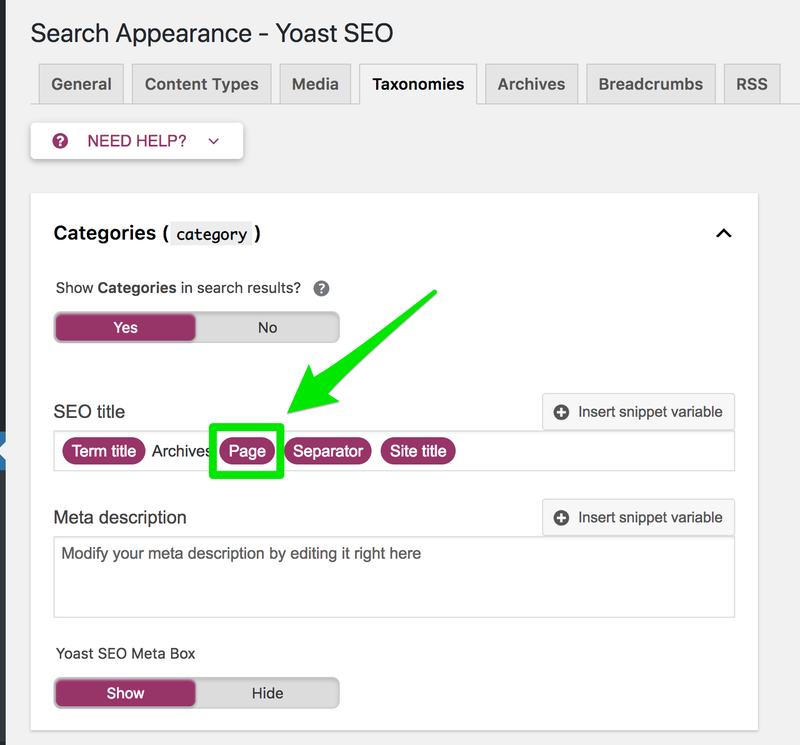 Home » WordPress Plugins » Yoast SEO Premium » How Do I Fix Duplicate Meta Tags? How Do I Fix Duplicate Meta Tags? Google Search Console (former Google Webmaster Tools) reports you have duplicate meta titles or duplicate meta descriptions. Each URL should have unique meta tags so this is important to fix as soon as possible. Change the title of pages to distinguish between the duplicate pages. Set all but one page to noindex. If you have paginated URLs with duplicate meta or title tags, you can add the page template variable in two ways. 1. Add the page variable to the metas template for a site-wide fix for pages, posts, or taxonomies that do not have custom meta tags. 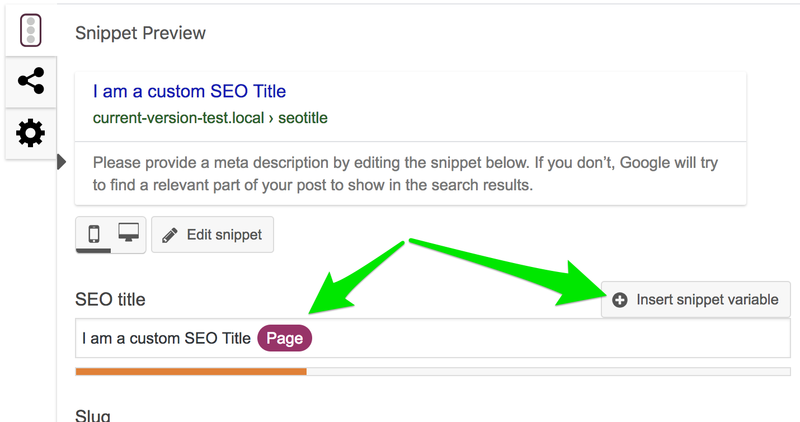 This variable can be added by going to SEO->Search Appearance->Content Types OR Taxonomies (depending on where the issue is) and making sure the title field has the page variable: %%page%%. 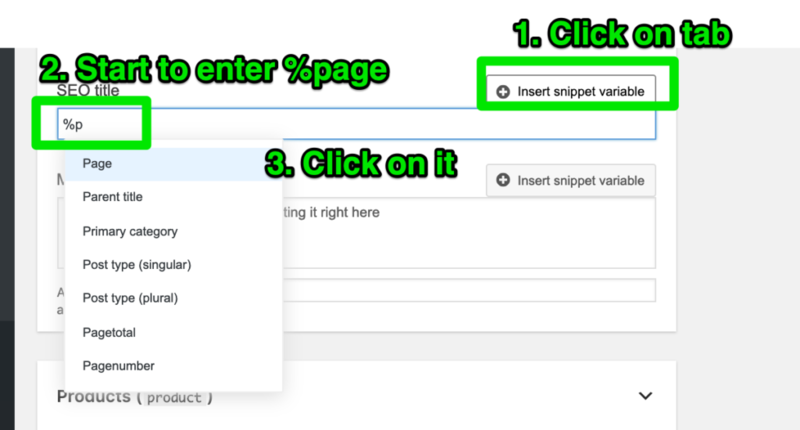 If you do not see the Page Template variable you will need to search for it by clicking on Insert Snippet Variable and then searching for the %page variable. 2. Add the page variable directly to the page, post, or taxonomy for customized meta and title tags. Google has advice on handling duplicate content caused by URL parameters here. Google has even more advice on handling duplicate content here.